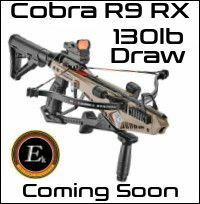 Introducing the MK-XB52 compound crossbow with an adjustable stock and anti-dry fire mechanism. 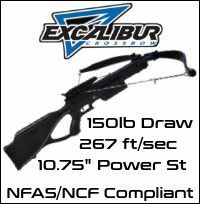 The crossbow has to be the best value power compound crossbow available at the moment and much cheaper than the all conquering Titan crossbow which may have met it's match. The MK-XB52 delivers 370 feet per second from a draw weight of only 185lb. The XB-52 is a light narrow crossbow with string stoppers, AR pistol grip, adjustable stock and fore grip which can be fitted anywhere along the full length picatiny rail. The picatiny rail can also accommodate added accessories such as bipods and torches. Fitted with the new style ball bearing bolt retainer eliminating accidental bolt retaining spring damage when cocking.